I’ve turned to a life of crime. It’s Day Four of my Week of Selfishness. Fun in the kitchen on Day One, some quiet writing time (and a super fun meeting) on Day Two, and a lovely brunch on Day Three. Today’s mission? Pot some herbs. I had no way of knowing it would take such a dark turn. I don’t always do my homework before I start a project. Usually I do my homework somewhere near the beginning of the project, so that’s something, but I tend to shop for supplies and THEN take stock of what I need. This invariably results in either having more than I need, or not enough. In this case, it was not enough. This is partly due to my efforts lately to not buy things I don’t need (I know, right?). So for my little planting project, I did not buy a trowel. I found that a half-cup measuring spoon did the transfer of dirt from bag to pot just fine. That was the best outcome of my self-restraint. 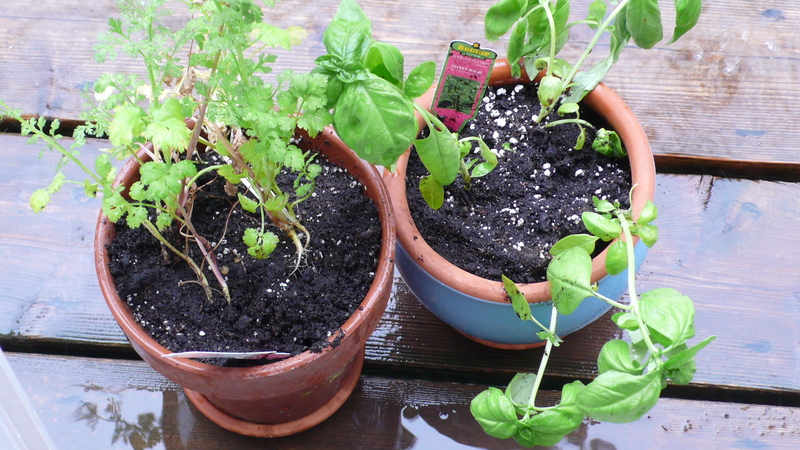 A few days ago, I bought three herb plants – basil, cilantro, and mint. Those are the ones I use most frequently in cocktails, so I thought I’d start there. I didn’t buy any pots. I had one from my days in an office that used to hold one of those viney plants everyone had on their file cabinets. The kind that is poisonous to a cat? I thought I’d put the mint in that one, as it’s a pretty and expensive pot, and I will keep the mint inside. Check. I knew that there were some pots in the pile of Her Things that remains in the garage, but it turned out there was only one in the size I need. Soooo… I went back out this morning to find a third pot. Found a cute/cheap fat blue guy in pretty short order. Done and done. When I got back home, I decided to google “how to pot herbs.” Yeah, I could’ve done that before I started any of this, but I didn’t. Don’t tell my dad. This is what I made off with. If anyone asks, you haven’t seen me. I cut a grocery bag to make a work space instead of a mess. Someone tell my dad! 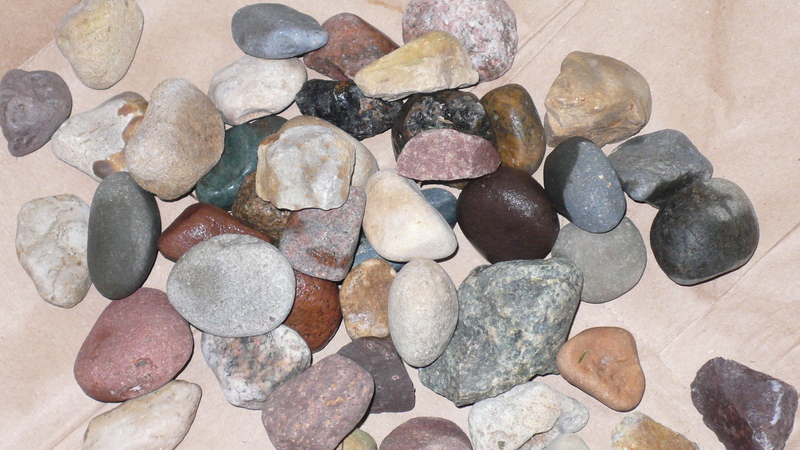 Pots and black market rocks lined up and ready to go. 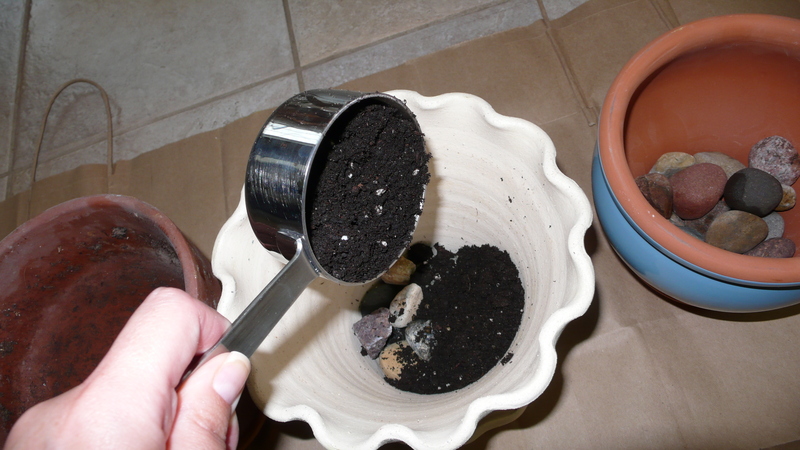 Next, with my trusty half-cup measure, I put a little potting soil on top. (I couldn’t find organic potting soil, only organic garden soil. I don’t know enough to know if they are interchangeable, but I assumed they make both for a reason. Anyone know where to find organic potting soil?) I peeled the compostable “pots” off of my plants and we sorted out where everyone was going to live. 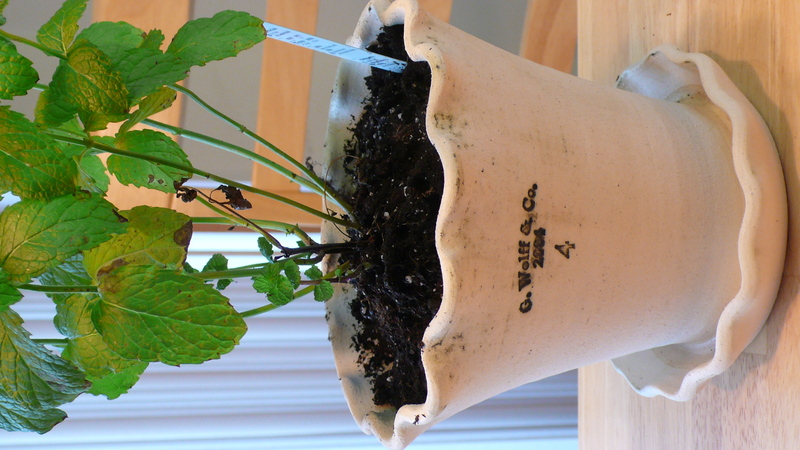 Mint went into my old favorite Smith & Hawken pot. Basil went into the fat blue pot, and cilantro into the found pot from the pile of Her Things. I wonder if that one will die first… Basil and cilantro are drinking buddies out in the rain today. They look like they’re having a pretty good time. I’ll let them settle in and hang some window treatments, and maybe in a couple of weeks I’ll whip up some salsa and a mojito… and a margherita pizza.